As an embryo develops, tissues bend into complex three-dimensional shapes that lead to organs. Epithelial cells are the building blocks of this process forming, for example, the outer layer of skin. They also line the blood vessels and organs of all animals. These cells pack together tightly. To accommodate the curving that occurs during embryonic development, it has been assumed that epithelial cells adopt either columnar or bottle-like shapes. However, a group of scientists dug deeper into this phenomenon and discovered a new geometric shape in the process. They uncovered that, during tissue bending, epithelial cells adopt a previously undescribed shape that enables the cells to minimize energy use and maximize packing stability. 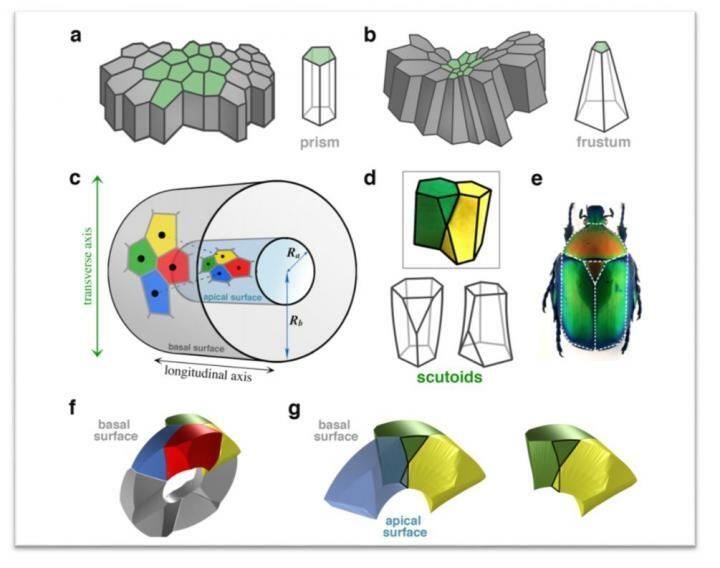 The team's results will be published in Nature Communications in a paper called "Scutoids are a geometrical solution to three-dimensional packing of epithelia" (DOI: 10.1038/s41467-018-05376-1). The study is the result of a United States-European Union collaboration between the teams of Luis M. Escudero (Seville University, Spain) and that of Javier Buceta (Lehigh University, USA). Pedro Gomez-Galvez and Pablo Vicente-Munuera are the first authors of this work that also includes scientists from the Andalucian Center of Developmental Biology, and the Severo Ochoa Center of Molecular Biology, among others. Buceta and colleagues first made the discovery through computational modeling that utilized Voronoi diagramming, a tool used in a number of fields to understand geometrical organization. "During the modeling process, the results we saw were weird," says Buceta. "Our model predicted that as the curvature of the tissue increases, columns and bottle-shapes were not the only shapes that cells may developed. To our surprise the additional shape didn't even have a name in math! One does not normally have the opportunity to name a new shape." The group has named the new shape the "scutoid," for its resemblance to the scutellum–the posterior part of an insect thorax or midsection. To verify the model's predictions, the group investigated the three-dimensional packing of different tissues in different animals . The experimental data confirmed that epithelial cells adopted shapes and three-dimensional packing motifs similar to the ones predicted by the computational model. Using biophysical approaches, the team argues that the scutoids stabilize the three-dimensional packing and make it energetically efficient. As Buceta puts it: "We have unlocked nature's solution to achieving efficient epithelial bending." Their findings could pave the way to understanding the three-dimensional organization of epithelial organs and lead to advancements in tissue engineering. "In addition to this fundamental aspect of morphogenesis," they write, "the ability to engineer tissues and organs in the future critically relies on the ability to understand, and then control, the 3D organization of cells." Adds Buceta: "For example, if you are looking to grow artificial organs, this discovery could help you build a scaffold to encourage this kind of cell packing, accurately mimicking nature's way to efficiently develop tissues."